The legend of Atlantis is one of the most intriguing mysteries of all time. Disproving many well-known Atlantis theories and providing a new hypothesis, the evidence for which continues to build, Andrew Collins shows that what Plato recounts is the memory of a major cataclysm at the end of the last Ice Age 13,000 years ago, when a comet devastated the island of Cuba and submerged part of the Bahaman landmass in the Caribbean. He parallels Plato’s account with corroborating ancient myths and legends from the indigenous people of North and South America, such as the Maya of Mesoamerica, the Quiché of Peru, the Yuchi of Oklahoma, the islanders of the Antilles, and the native peoples of Brazil. The author explains how the comet that destroyed Atlantis in the Caribbean was the same comet that formed the mysterious and numerous elliptical depressions, known as the Carolina Bays, found across the mid-Atlantic United States. He reveals evidence of sunken ruins off the coasts of both Cuba and the Bahamas, ancient complexes spanning more than 10 acres that clearly suggest urban development and meticulously planned road systems. Revealing the identity of Plato’s “opposite continent” as ancient America, Collins argues that Plato’s story was first carried back to the Mediterranean world by trans-Atlantic mariners, such as the Phoenicians and Carthaginians, as early as the first millennium BC. He offers additional ancient trans-Atlantis trade evidence from Egyptian mummies, Roman shipwrecks in the Western Atlantic, and the African features of giant stone heads in Mexico. 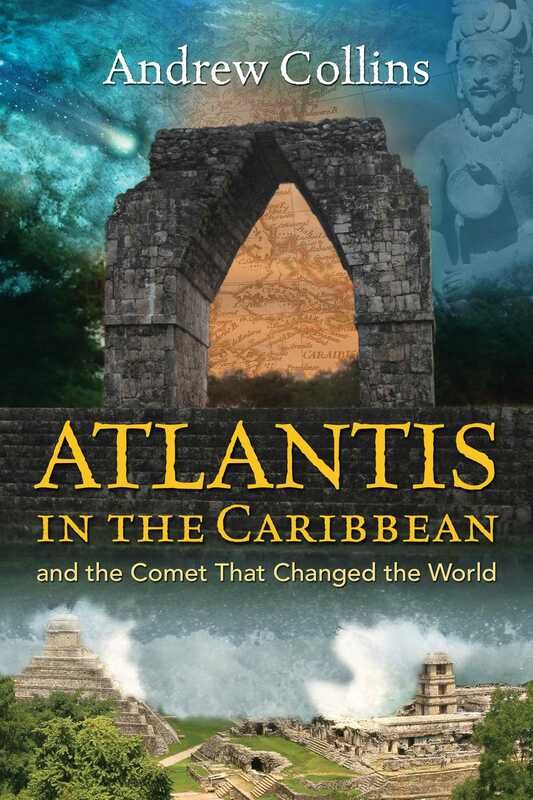 Piecing together the final days of Atlantis and the wildfires, earthquakes, tsunamis, days of darkness, and advancement of ice sheets that followed the ancient comet’s impact, Collins establishes not only that Atlantis did indeed exist but also that remnants of it survive today, most obviously in Cuba, Atlantis’s original central island. Where might we start looking for the island homeland spoken of in so many creation myths of the Mesoamerican peoples? There is a major clue to be found on the exterior walls of the Temple of Quetzalcoatl at Teotihuacán. Its facades are adorned with stone heads of the plumed serpent attached to serpentine bodies that undulate in and out of various types of seashells. The problem here is that Teotihuacán is 320 kilometres away from the Gulf coast, and, as Mesoamerican scholar George C. Vaillant realized, the seashells shown on the temple walls are unique to the Caribbean. The identity of those who constructed the great city and religious center of Teotihuacán remains a mystery. Yet this distinction was claimed by the Totonac peoples of eastern Mexico in their own sacred history. More significantly, these annals speak of their race arriving in the land of Anahuac from Chicomoztoc, the Seven Caves. I was therefore intrigued to discover that in 1971 archaeologists uncovered “several” hewn chambers directly beneath the Pyramid of the Sun at Teotihuacán. They are described as forming a virtual clover-leaf arrangement, which, when seen in concert with a long entrance chamber, gives them the seven-fold symbolism of the cave of emergence so familiar to Mesoamerican tradition. If the chambers uncovered beneath Teotihuacán’s Pyramid of the Sun do represent the Seven Caves, we can be pretty sure that they are copies of an earlier structure that signified the true place of emergence of those who built this magnificent city. The clear connection between the Seven Caves symbolism at Teotihuacán and the Caribbean cannot be ignored. Did the founders of this race come, as the Totonac annals imply, from an island landmass in the Caribbean Sea? Having reviewed all available material on the origins of Quetzalcoatl, American historian Robert B. Stacy-Judd, author of Atlantis--Mother of Empires, published in 1939, concluded: “As the traditions of the Aztecs frequently refer to their original homeland as ‘on a great water’ perhaps we may assume as fact that Tollan-Tlapallan, the land from which Quetzalcoatl came, was situated in ancient Antillia, of which the present Greater and Lesser Antilles are now all that remains.” By “ancient Antillia” he was alluding to the theory proposed by early twentieth-century Scottish mythologist Lewis Spence that the final portion of a much greater Atlantean continent existed in the region of the West Indies. To this smaller landmass Spence had allotted the name Antillia, after the legendary island of the same name. Yet how might we better pinpoint this original homeland? Where might vessels belonging to the People of the Serpent have come from before they likewise reached Cozumel Island? Due east of the Yucatán at a distance of no more than 250 kilometers is Cuba, where both Grijalva and Cortés had set out on their own respective voyages to New Spain. Was it possible that the legendary founders of the Mesoamerican tribal dynasties came originally from Cuba? In his History of de Nuestra Senora de Izamal, the Spanish historian Lizana included a detailed look at the early history of the Yucatán. He collected memories that suggested that the earliest inhabitants of the peninsula had come originally from Cuba, where they had settled after leaving Haiti. Other Spanish authors concluded from stories related to them by the Nahua that Chicomoztoc could be found either in Florida or on Cuba. One possible way of rectifying the situation was to find the Seven Caves. If such a place once existed, it might have continued to be revered even after the ancestors of the Mesoamerican ruling dynasties had departed their homeland. Was there any sacred place or archaeological site that matched the description of the Seven Caves anywhere in Florida, the Bahamas, or the Caribbean? Just one site fits the description perfectly, and this is Cueva #1, found among a group of “seven caves” at Punta del Este on the Isle of Youth, which lies some 100 kilometers south of the Cuban mainland. Could this obscure grotto be the place of emergence spoken of with such reverence in the creation myths of the Mesoamerican peoples? If so, what might it tell us about the origins of the elite group described as “feathered serpents,” who brought civilization to the various indigenous tribes, and how might this knowledge affect our understanding of Cuba’s role in the Atlantis legend? Andrew Collins was born on January 25, 1957, in Bedford, England. He is a science and history writer and the author of books that challenge the way we perceive the past. They include From the Ashes of Angels, Gods of Eden, Gateway to Atlantis, Tutankhuman: The Exodus Conspiracy (co-authored with Chris Ogilvie Herald), The Cygnus Mystery, Göbekli Tepe: Genesis of the Gods, and The Cygnus Key: The Denisovan Legacy, Göbekli Tepe, and the Birth of Egypt. He lives in Leigh-on-Sea, Essex, UK. His website is http://www.andrewcollins.com/.